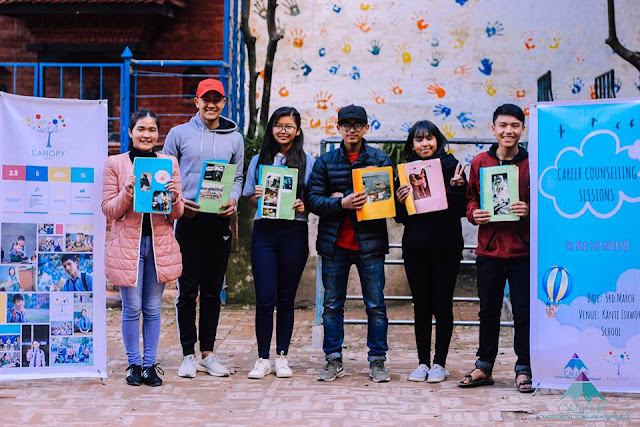 Canopy Nepal is a team of visionary youths working in the field of education, skill and leadership development, diversity and inclusion. Canopy Nepal aims at creating an environment where individuals have a choice to equip themselves with skills and abilities of lifetime importance. The organization intends to promote intercultural understanding among diverse groups by the means of various programs. CANSHIP is one of the scholarship programs conducted by Canopy Nepal. It is operated in partnership with Nepali Children's Education Project (NCEP) Canada. Through the program, indigent students who are enthused about learning but are not able to afford it, are supported through the provision of stationery supplies, uniform, tuition fees, tiffin expenses. Currently, 52 scholars in different parts of the Kathmandu valley are being supported by the program. The help provided to the students does not just limit to fulfilling the materialistic needs of the children but also overseeing their holistic well-being. The program has been tending the scholar’s well-being through regular home visits and one to one interactions during school visits to understand the household environment as well as their overall health. Under the CANSHIP program, ‘Career Counselling’ is one of the most prominent programs designed to help students choose their most desired and suitable courses post SEE. Through this program, certain direction on what to pursue further ahead is visible to the children. This program holds the aim of creating awareness of different streams by explaining the relevance in Nepal along with its scope and possible challenges. They discuss the courses from which they can choose, and their alternatives in different fields such as management, humanities, science, and even music, etc. Moreover, this program simultaneously motivates children to pursue further academic qualification by providing them with in-depth knowledge about the courses. Career counseling is conducted within 2 days, in a span of two-weeks. On the first day, children designed their ''Career Profile''. It is a creative method of self-assessment, where students analyze their own strengths, weaknesses as well as opportunities through different fun and engaging activities. Finally, on the last day, a panel discussion is conducted where individuals from different stream come together to discuss its horizon. This way the students can ask their desired questions and understand the different careers. Meanwhile, including a family member has been on the priority during this program. They attend the program with their children to understand the scope themselves. They can also see the paths their children are desiring to take and be part of their journey. The first session of Career Counselling was conducted with our six SEE appearing students from three different schools. The children had their own bit of fun but by the end of the day, they got a chance to get a clearer idea about their desired paths to pursue. Here is what the scholars are aiming to pursue after the program! Sharmila wants to be a Nurse and go abroad so that she can pursue bigger opportunities in life ahead. Binu plans to study Science so that she can conduct scientific researches some day. Rabin wants to study Humanities so that he can pursue his passion in the arts field. Sarita aims to become a Nurse and work as a Health Worker in rural areas and help needy people. Ram wants to study Hotel Management to be able to earn his own income in the near future. - "The one thing that sticks to my heart about the whole program is how the students, teachers and our team are knitted into a community. We are connected by our scholars' stories of their academic and extra-curricular achievements and also the challenges they face during the process. And to see that all of us are working towards a common goal of providing quality and holistic education to these kids makes it a lot more doable and exciting!